The brown fixtures are cool-retro and all, but they have years of hard water deposits on them and don't fit the aesthetic I hope for in this room. So I started to search Craig's List. We have no immediate plans to start on this room, but I figured it might take awhile to find the perfect tub. Surprisingly, tubs popped up for sale more often than I expected, but most of them weren't in the best condition and would need to be reglazed. A phone call to a professional revealed a whopping $795 price tag for reglazing a claw foot tub. Considering they go for at least $2000 brand new, that might not be so bad. But considering the finish is only guaranteed to last 10-15 years, I was sadly beginning to feel this option might not be for me. 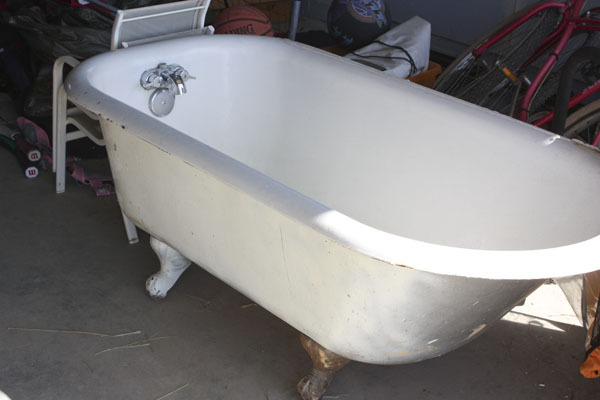 And then I found a listing for a tub that looked like it might work with its original finish. I called to set up a visit. And here is where it turned into one of those situations that felt like it was "meant to be". I talked to the guy to ask a few questions and told him I would call back when I had an opportunity to bring my husband in to look at it. (I don't like to look at Craig List finds alone. Never mind the fact that I would never be able to load a claw foot tub by myself.) The next day it rained (yes!) freeing up Tom to go with me, so I called him back and got his voice mail. When I heard his first and last name on his voice message, it clicked. I knew these people! It happened to be my brother-in-law's sister and husband. It definitely needs a little TLC. The outside needs sanded and painted—I'm thinking a charcoal gray. I will paint the feet oil-rubbed bronze (or white?). The tub was built in, so their is caulking and paint along the top edges that needs to be scraped off. And the inside just needs a good scrubbing. There is a bit of yellowing around the drain, but overall the inside looks great. There are a few chips in the enamel, but only around the edge of the rim. 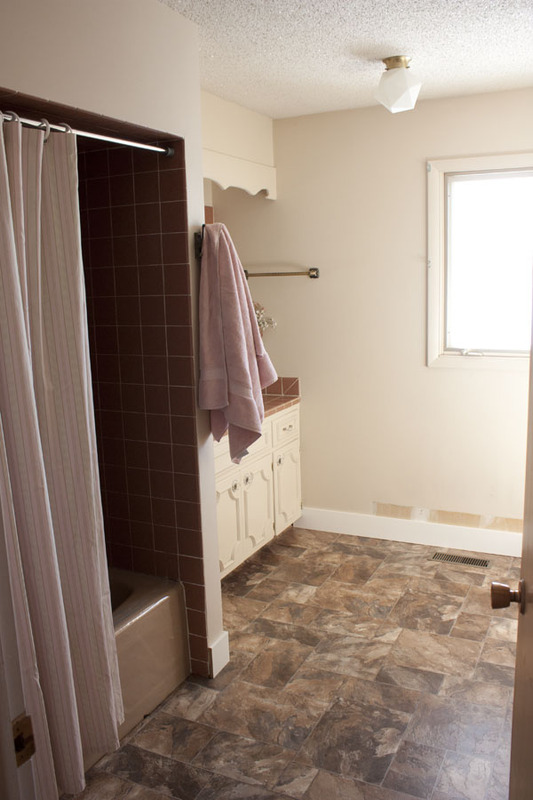 We will either live with the imperfections or try a little enamel patch kit since it isn't on the interior of the tub. I love the mid century vibe of this desk/credenza and I think something like this would be very appropriate for this house. This seems like a pretty legit antique to me. I love that it is meant for bathroom duties, complete with spot for a wash basin, towel bar, and "potty cupboard". Of course I haven't seen this in person so I have no idea if it would work for what I need. They are asking $300 for it. So, help me out. What do you think? Do you like the antique or should I hold out for a vintage mid century cabinet?